A berg the size of Delaware is surprisingly hard to see. An iceberg as big as Delaware is about to break free from the Antarctic Peninsula, but no one will see it. Antarctica is in the dark depths of winter, and much of the continent will not see daylight again for weeks. At the Larsen C ice shelf, which is close to the continent’s most northerly tip, the sun might graze the horizon for a couple hours at midday before dipping back down for another long night. For this reason, planes don’t fly over Antarctica in the wintertime, barring extraordinary circumstances. And yet, we’ll know when this behemoth slab of ice calves from the shelf and drifts off into the Southern Ocean, and we’ll know which direction it heads. We will know thanks to NASA and European Space Agency (ESA) satellites, which use clever workarounds to see what cannot be seen. Infrared image shows the progress of a rift that will soon calve one of the biggest icebergs ever seen. NASA peered through the darkness with its Landsat 8 satellite last month. It used infrared thermal sensors to visualize the rift between the iceberg and the ice shelf, which only has five miles to go before separation is complete. The thermal sensors exploit the difference in temperature between the ocean and the ice surface, which is colder than the open water. In the map below, darker blues indicate where the ice is thin or mixed with seawater. Microwave data allows scientists to track ice movement. The rift tripled in speed at the end of June. Unfortunately, the thermal sensors don’t work when it’s cloudy — which, in that part of the world, is often. Instead, scientists with Project MIDAS are tracking the progress of the rift with data from the ESA’s Sentinel-1 satellite, which satellite collects synthetic aperture radar using microwave energy. It can image the ice shelf day or night, cloudy or clear, and is the primary tool for tracking the crack for that reason. The radar does not directly show ice movement, but the researchers infer it by comparing sequential images. Data from CryoSat allows scientists to measure the iceberg's size. 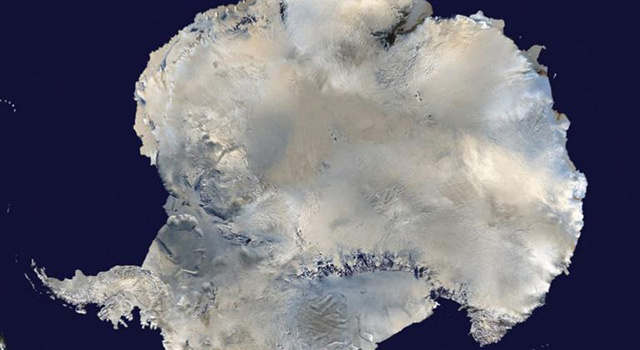 Another ESA satellite, CryoSat, is responsible for measuring the iceberg’s incredible girth. This orbiter is equipped with a radar altimeter designed specifically to monitor the elevation of the world’s icy surfaces. Because the iceberg is part of a floating ice shelf, if you know how far above the surface of the ocean it is, you can calculate how deep it goes below. ESA scientists estimate that the runaway berg is 620 feet thick and has a volume of 277 cubic miles. With that much ice, you could fill Lake Erie twice over, with plenty to spare. This is what the rift looks like in daylight. The widest part of the crack is now widening at a rate of 33 feet per day. This iceberg will take years to melt completely, and it will likely break into smaller chunks as it meanders among the currents toward the tip of South America. Navigation charts will mark its changing location so that ships can avoid a Titanic situation. Through it all, NASA and ESA satellites will be there, seeing through the darkness and the clouds where our own eyes fail us.